Every time Dylan makes a wish she wishes for a paint horse. 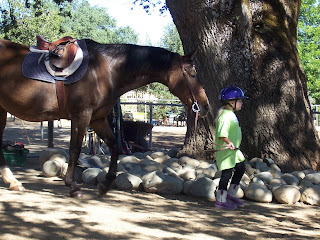 Her love of horses is so deep and so strong that I worry about her not getting her own horse soon. Having a horse as a kid made me such a better person. I learned to care for something that completely relied on me. At age 6, my first horse was a pony named Trigger. He gave me such a sense of independence while taking good care of me. He was fast enough to make me feel like I was flying, yet gentle enough to make sure I didn’t get hurt. He was such a great first horse. My next horse was Mayday whom I loved for nearly 20 years. When I went away to college and my parents told me I could only keep one of my four horses she was the one I kept. Although I went to college in Northern California, I would often fly home for just a couple hours to ride Mayday. Just being near her cleared my head and made things right in my world. It is no surprise to me that Dylan loves horses. But I was surprised the first time she rode alone. She was so natural, so sure of herself, so happy. She reminded me of myself as a kid. She reminded me what is missing in my own life. The answer is simple. We need a horse. I need horse. I've only ridden a horse once, but I loved it. I'd love to actually own a horse. Hopefully Dylan will get her wish. I've never owned my own horse and my experience is limited to trail riding but I find that even that is an amazingly calming and serene experience. I can imagine having a relationship with and riding the same horse day in and day out becomes a beautiful friendship. that is so sweet....I hope you both get a horse, and soon.